Roads are everywhere so this week’s subject wasn’t hard to find. I’m very interested to see how the challengers interpreted it. Paved road? Dirt road? Gravel Road? Road signs? Traffic? I’m chomping at the bit to click through them. But until more are posted, you’ll just have to settle for moi. The cool thing about working downtown is finding parts of the city most overlook. Like alleys. I don’t go down too many on my own, but I’ve done a few walkabouts with co-workers and have spent time clicking away while traveling on paths between buildings. And it’s different from what you see on the sidewalk. Buildings seem more interesting. Graffiti begs to be photographed. Windows take on a different view completely. And that’s only part of it. This particular alley (behind Murphy’s Paints for those that are curious) has original bricked pavement. These bricks were flooded by the Ohio River in 1932. These bricks were windblown by a tornado in 1974. These bricks were recently frozen over with layers of ice this past January. 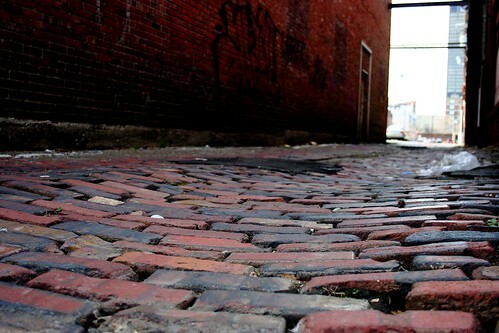 Who knows how many pairs of shoes have walked on these bricks. Or how many heads have rested on them. Or how much Big Red has been spilt on them by those taking a shortcut from White Castle. Next week’s subject is “feet”. Another subject that shouldn’t be hard to find. Be sure to head over to our flickr pool to see what bright ideas were thought up this week by challengers. I’m dying to see everyone’s photos. The Weekly Photo Challenges definitely make Wednesdays much much sweeter for me. So I’m sending a big THANK YOU to those who keep posting. You all have amazing artwork that you share. 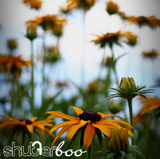 ~ by shutterboo on December 16, 2009. Yet another fabulous shot Boo! I can just picture you getting eye level with those bricks to get that shot. Hilarious! Well, I am for one glad I joined the photo group. It also makes Wednesday’s less boring for me. What I like most about being apart of this group is that I actually have people from the group comment my postings and vice verse. Most groups people just join and forget about. Ya know. I like the groups effort and without you bringing this to life, we wouldn’t have such fun or support, photographically. So, THANK YOU! FABulous! I love all the colors in the brick!